Although you can create accessible PDF files in several programs, Adobe Acrobat Professional is required to evaluate, repair, and enhance the accessibility of existing PDF files. This page outlines accessibility features of Acrobat X and XI. If you are using an earlier version of Acrobat, read the article on Acrobat 7-9 and accessibility. What's new in Acrobat XI? The Set Alternate Text option makes it much easier to add and edit alternative text for images. Options for Heading 1-6 are available in the TouchUp Reading Order tool (previously Heading 1-3). The accessibility checker and wizard are greatly improved. The Tags pane allows you to view, reorder, rename, modify, delete, and create tags. Many of these actions can be completed more easily using the TouchUp Reading Order tool outlined below, but there are some actions that can only be accomplished in the Tags pane. To view the Tags pane, select View > Show/Hide > Navigation Panes > Tags. This pane displays the all the tags within the PDF, organized in a tree structure. This tags tree can be navigated, expanded, and collapsed using a mouse or the arrow keys on the keyboard. Many of the tags are similar, if not identical to HTML. The most notable exception is the <Figure> tag, which is similar to the <img> tag in HTML. When the Highlight Content option is selected in the Options ( ) menu, selecting a tag should highlight the corresponding text, image, or other element in the PDF file. Just as selecting a tag highlights the content in the body of the PDF file, there is a way to accomplish the opposite effect of highlighting the tag that corresponds to selected content. First, click on the Select Tool . Next, select text, an image, or a table. Finally, select the Options menu at the top of the Tags pane and then select Find Tag from Selection. This will highlight the tag or tags that contain the content you previously selected. At times, you will encounter a PDF file that contains incorrect tags. You can modify these by right-clicking the tag you want to change, selecting Properties, then the Tag tab, and then selecting the appropriate new tag type from the dropdown list labeled Type. To add tags to an untagged document, choose Tools from the right-hand menu, then select Accessibility > Add Tags to Document. This process can sometimes be time-consuming, and you will almost certainly have to edit some of the tags, but it is usually faster than doing all the work manually. This is especially true if the document contains tables. The TouchUp Reading Order (or TURO) tool allows a user to add and edit many common PDF tags, and to view the content order of elements on the page. Although it can speed up the tagging process, it does not take the place of the other tools mentioned previously. Certain tags, such as lists, are only available in the Tags pane. To use the TURO tool, select Tools from the right-hand menu, then select Accessibility > TouchUp Reading Order. If the Accessibility menu is not visible (it is hidden in version XI by default), make sure it is checked in the option menu ( ) in the upper-right corner of the Tools sidebar. When the TURO tool is selected, the view on the screen changes. All of the content is enclosed in numbered boxes. Each of these numbered boxes corresponds with the content order of the PDF, as reflected in the order pane. There are actually three different types of 'reading order' within a PDF: the visual order that most people see when viewing a PDF, the tags order that is accessed by screen readers and other assistive technologies, and the lesser-known content order that is used by Adobe when a user selects Reflow or Read Out Loud options. While the goal is to get these three views to match, this is not always easy to accomplish. For example, if a PDF is created from a MS Word DOCX file, text boxes and images usually appear in the correct place in the tags order, but they typically appear at the end of the page in content order. The TURO tool displays the content order of the PDF, NOT the tags order. Reading order can appear correct in this view but the PDF may still be read incorrectly by a screen reader (or vice versa). Only the Tags Pane provides a true indication of how content will be read by a screen reader. The TouchUp Reading Order window includes a number of options to change tags within a page. You will notice a group of buttons with the names of several common tags. You can use these buttons to assign tags to a selected block of text or an object. If you have the TURO tool open and don't see any boxes, your PDF document is most likely untagged. Drag a box around an element using the crosshairs that have replaced the default pointer. It is sometimes difficult to select exactly the right area, but it is a little easier if you try drawing a box that is slightly larger than the element. Once you have selected a new element, you can assign some of the most common tags to that element by clicking on one of the several buttons. You can also select everything within a box by clicking on the number in the top-left corner. Now that you have selected the text, you can assign a tag by clicking on the corresponding button. Once you select a button, Acrobat will place the selected content in the appropriate tag. If you have the Tags pane open, you can view these changes instantly. While in TURO, you can also assign alternate text to images by right-clicking on the image and choosing Edit Alternate Text. Heading 1-6 <H1>-<H6> Only H1-H3 are available in Acrobat X.
Figure/Caption <Figure> <Caption> If you select the image and adjacent text then the image will be tagged as a figure and the text will be tagged as its caption. Table <Table>, <TR>, <TH>, and <TD> Acrobat attempts to assign rows, columns, and headings. Sometimes it does this correctly, but this should still be checked with the table inspector. Cell <TD> Can be used to merge cells if they are incorrectly split. Background none This will hide an item completely from a screen reader. It can be used on images and text. The Order pane allows you view and edit the content order of a page. To open the Order pane, select or View > Show/Hide > Navigation Panes > Order or select Show Order Pane in the TURO tool. To change the order of an element, just click and drag the tag to the location that reflects the correct reading order. This tool can be problematic because while it displays the content order (not the tags order), changes made within this panel will typically be reflected in both the tags and content order, but this behavior can be unpredictable. If there is a mismatch between these views, use the Content and Tags panes separately to reconcile these differences. When an image is tagged as a figure, the alternative text will appear in a black box in the upper left hand corner of the image. If it has no alternative text, the caption will read "Figure - No alternate text exists." To add or edit alternative text, right click on the image and select Edit Alternate Text. Enter the appropriate alternative text in the dialog box. The Table Inspector allows you to easily identify and assign scope to table headers. With the TURO tool open, select a table and then select Table Inspector. You can now select table cells that should be headers. Right click on a selected cell or cells and choose Table Cell Properties. A dialog box will appear. If the selected cell(s) needs to be tagged as a header (<TH>), select the Header Cell option and assign a scope of either Row or Column. After selecting OK, you will notice that the table header cells will be highlighted in red and the data cells will be highlighted in gray. Artifacts are elements that are ignored by a screen reader, much like an image with empty alternative text in HTML. Important text should never be labeled as an artifact. The easiest way to change an element to or from an artifact is with the TURO tool. Select the element and press the Background button to make it an artifact. To search for artifacts, go to the Tags pane and select Options > Find. A window will appear with several search options. Artifact is the default search, so click Find. If there are any artifacts, the search will identify them and allow you to change them to other elements. To change a tag to an artifact in the Tags pane, right click on the item and select Change Tag to Artifact. By default, the TURO tool displays the reading order of the objects in a page, but this can be changed in Acrobat XI so that the tags or "Structure types" are displayed instead of the "Page content order". To make this change, select the Structure types radio button within the TURO window. This will change the view so that the white boxes in the upper left corner of each element displays the tag (e.g., "P" or "H1") instead of the reading order. Acrobat Professional X includes two different Accessibility Checks. The first, the Quick Check, is not very helpful--it basically tells you whether the file has tags or not. It doesn't identify even the most basic errors, such as missing alternate text. The accessibility "Full Check" (available in both Acrobat X and XI) is a much better option. This can be a good tool to ensure that nothing was overlooked (e.g., document language). To run the full check, select Tools in the right-hand column, > Advanced > Accessibility > Full Check. The Accessibility check in version XI is a bit more complete than version X and provides better documentation. Alternative text can be added to all images in the document at one time using a great new feature in Acrobat XI. In the Accessibility sidebar, select Set Alternate Text. The first image in the document will be highlighted and a dialog box will appear with a space to enter the alternative text. The dialog box also has a checkbox to identify an image as a Decorative figure. Unfortunately, this feature does not work as it should. 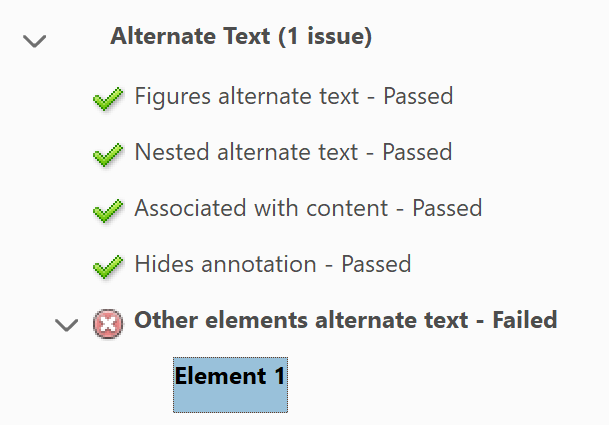 If you check this box and run the Accessibility Full Check again, the error for the image will change from "Figures alternate text - Failed" to "Other elements alternate text - Failed." Instead of using this checkbox to flag a decorative image, skip to the next image by pressing the right arrow in the dialog. After adding alternative text to all the images that need it, use the Background button in the TURO tool to hide any images that should not be read by screen readers. Before you can create a tagged PDF, you must first ensure that the PDF contains real text. If it does not, you must either recreate the PDF file (if you have the original file) or convert it to include true text. To convert the document, select Tools in the right-hand column, then select Recognize Text. The quality of the text depends on the quality of the source document. The conversion is usually fairly good, but you should probably clean up the document by selecting Find All Suspects in the Recognize Text submenu. The Reflow view allows users to reorder the content of a PDF into a simplified, single-column layout, based on the content order. Select View > Zoom > Reflow or Control + 4. If the document does not appear in the correct order while in Reflow view, the order of the tags will need to be changed. Read Out Loud is a text-to-speech tool that is available in Adobe Reader and Acrobat. Because it reads the PDF based on the content order, it should not be used in place of a screen reader for testing. The Action Wizard helps automate multi-step processes, like the creation of an accessible PDF. If you PDF is already tagged (e.g., you created a PDF using instructions on the last page) you must skip step 3: "Recognize Text using OCR." Otherwise, you PDF will be re-tagged, and the new tag structure is seldom as good as the original structure. To skip this step, preferably before you start the wizard, right-click "Recognize Text using OCR" and select "Skip This Step". You will still want to check the quality of your tags using the TURO tool after running this wizard. For a video walkthrough and handout on the "Make Accessible" Wizard, see the GOALS Acrobat cheatsheet. This wizard misses a few key steps such as recognizing the text using OCR, but it can still be a helpful for common issues such as missing page title.